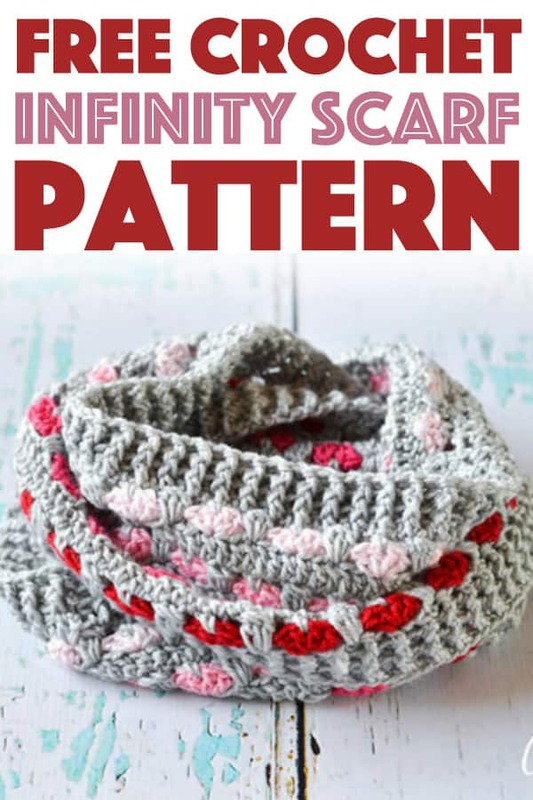 Infinity Scarf Crochet Pattern: this heart motif crochet pattern is so cozy! 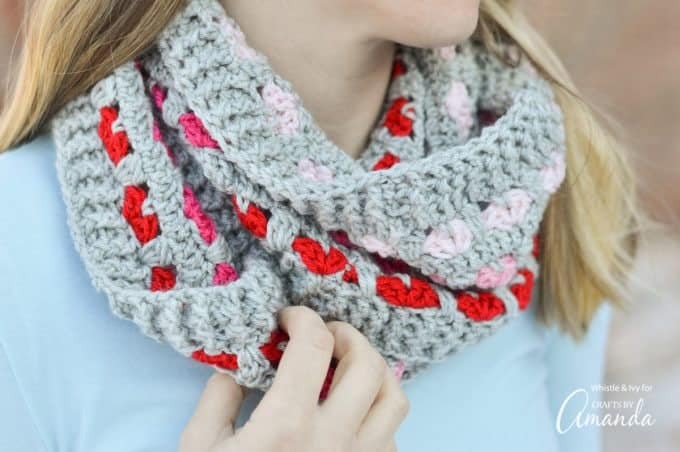 With Valentine’s Day around the corner, it’s the perfect time to share this heart motif infinity scarf crochet pattern. This is a great adult craft project, allowing you to challenge your inner crochet skills. 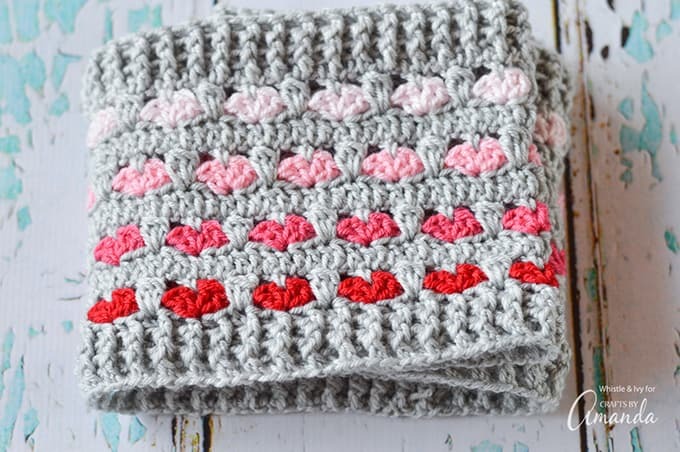 This scarf pattern is the perfect length to keep you cozy during the frigid months of January and February, plus the little hearts are just so pretty! Hello, friends! My name is Bethany, and I am the blogger behind Whistle and Ivy, a fiber arts and crochet blog. Don’t be intimidated by those adorable little hearts. They aren’t difficult to master and I think you will be surprised at how easy they are to make. I included a few photos to help you along, but I’ve also included a video for this infinity scarf crochet pattern if you need a visual. You can watch the video below! Be sure to make this infinity scarf a set with my FREE Puppy Love Slouchy and Arm Warmers Patterns. 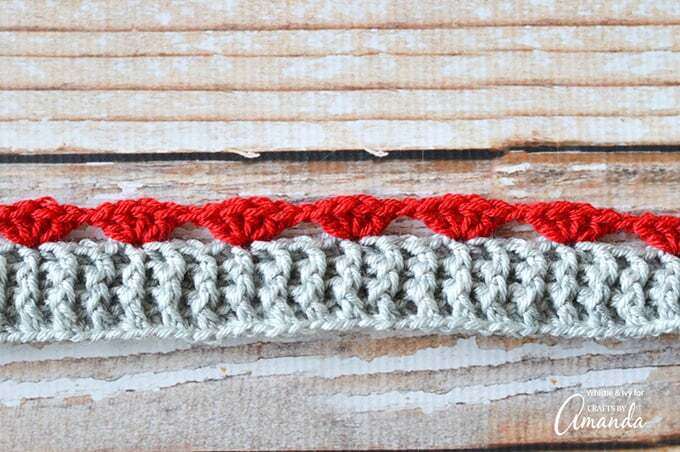 Make sure to check out these 40+ free crochet patterns. These range from simple patterns to tons of different ideas for you to crochet and get creative with. 3-dc cluster: Yarn over, insert hook. Yarn over, pull through st (3 loops on hook). Yarn over, pull through first 2 loops (2 loops remaining on hook). Yarn over, insert in same st. Yarn over, pull through. Yarn over, pull through first 2 loops (3 loops remaining on hook). Yarn over, insert into same st. Yarn over, pull through. Yarn over and pull through first 2 loops. Yarn over, pull through all 4 remaining loops. If it’s easier to understand, it’s basically a dc3tog worked all in the same st.
Ch 198. Sl st into 1st ch, careful not to twist. Should be just under 50″ long. 4. Ch 1. 4 dc in same st. *Ch 1. Sk 5 sts. 4 dc in next st.* work 32 times. Ch 1. Join with 1st dc. (165 sts). 6. Ch 2. Dc in each st around. Join with a sl st. (198 sts). Tip: If you found you dropped a stitch in row 5, it is easiest to add them into this row instead of pulling out your work. 7. – 15. 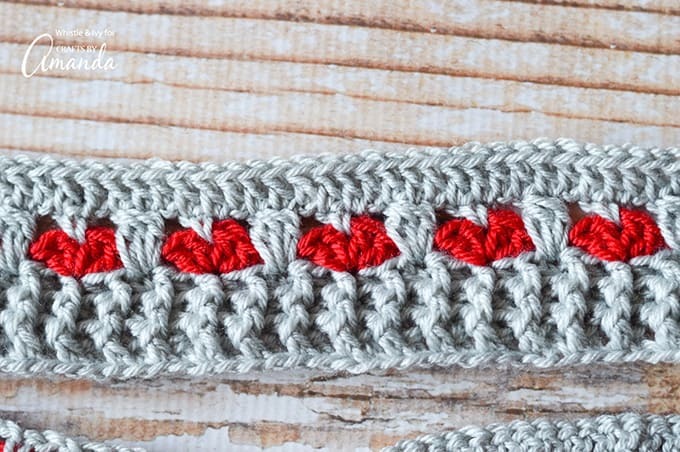 Repeat rows 4 – 6 respectively, joining a different color each time you work the hearts row. 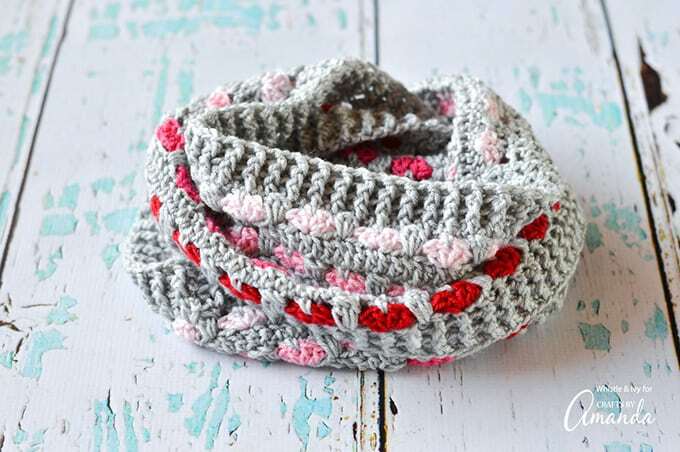 Now you have an adorable heart accented puppy love infinity scarf! This would make a lovely Valentine’s Day craft or gift for someone you love. Isn’t it gorgeous? I hope you enjoyed making (and enjoy wearing) your new Puppy Love Infinity Scarf! If you like your infinity scarves a little longer, you can make your foundation longer, just be sure your chain is in multiples of 6. Interested in knitting an infinity scarf? This Faux Cable Infinity Scarf pattern is an ultra fluffy and comfy FAUX cable knit scarf. That’s right, faux cable! Maybe you’d be interested in a cute Messy Bun Hat pattern! Messy bun hats are great for keeping your head and ears warm, while still being able to tie up your hair. This post was originally published on this blog on Jan 24, 2017. 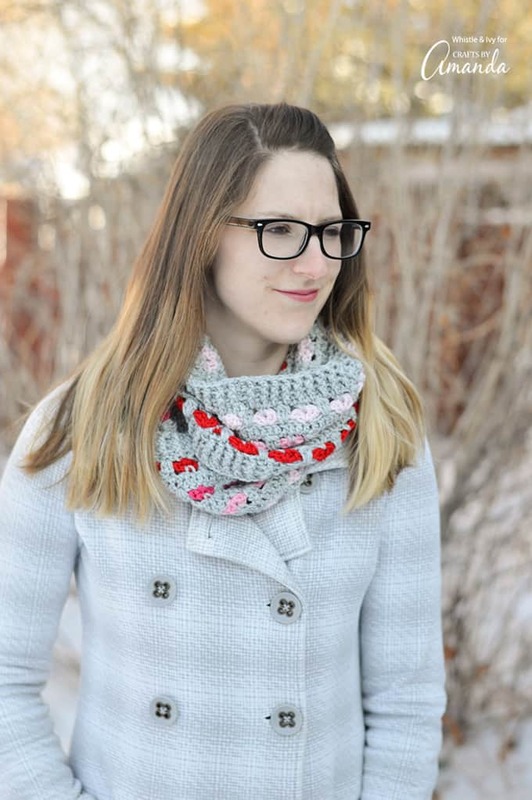 Thank you so much for sharing this adorable Valentine’s infinity scarf. I saw it on Pinterest yesterday, the day before Valentine’s and got crocheting right away. Turned out so cute! Thanks again! How fun, so glad you liked it! I absolutely LOVE this infinity scarf and I’m very excited to try it. Thank you so much for making the video to go along with the written pattern. I found it extremely helpful. What a cute scarf! 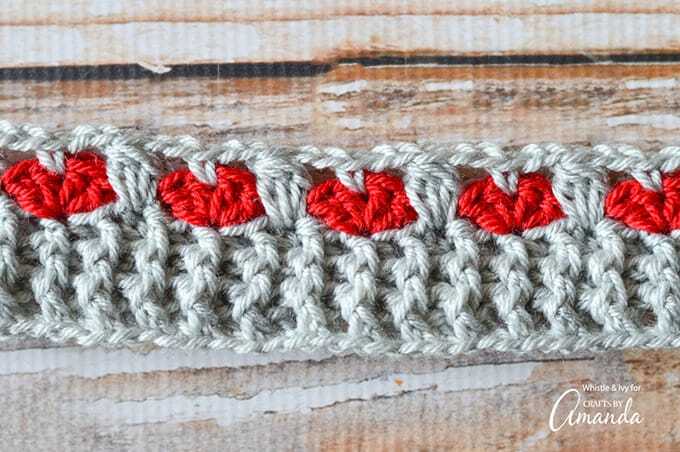 I have the pattern featured on a Valentine’s Day roundup post on my blog :).